Has #Brexit distracted you from your American responsibility of talking/thinking/hearing/journaling about Donald Trump every second of the day? Have no fear — Trump's comments on the Brexit vote have been characteristically out-of-touch to a fault and complete with the most satisfying narcissism and conspiracy. Perhaps the most timely was Trump's announcement on Friday that the Brexit would be a “great thing,” right after touching down in a country that expressed mere hours before that it was overwhelmingly against the United Kingdom leaving the European Union. 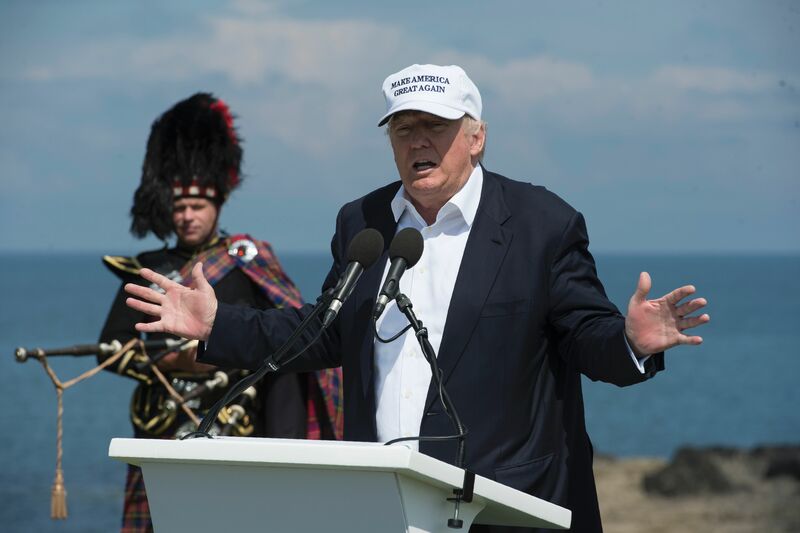 That’s right, against the kilt-ridden landscape of his golf course Trump Turnberry, Trump praised Brits for “basically (taking) back their country,” while Scotland contemplated leaving the United Kingdom because of the vote. For a different angle of irony on this issue, a tweet from writer Jody Rosen can help you out. The photo in his snarky tweet features Trump at Trump Turnberry, smiling dulcetly as if completely unaware of the storm of dissension erupting around him in the aftermath of the Brexit vote. The helpless expressions on these decked out Scots provide the perfect opportunity for Rosen’s sarcastic point. They definitely look like they’re waiting for their hero. Unfortunately, if recent reports on Trump's campaign are to be trusted, the only means Trump might have left to help them out with could be his winning smile and the golf club it appears he totally knows exactly how to hold. In his speech at Turnberry on Friday, Trump couldn’t resist spinning Brexit into more evidence in favor of the win he predicts for himself this November. As John Cassidy pointed out in the New Yorker on Thursday, Trump’s campaign has a lot in common with the populist, nationalistic Brexit movement in the United Kingdom. However, Cassidy noted the United Kingdom was expected to elect to stay in the EU — and it didn't. Does that bode well for Trump? If the far-right insurgent movement in Great Britain was powerful enough to shock the international community with their “us first” approach, will the force of rowdy Trump supporters in the United States be next to astound? Trump certainly seems to believe this to be true. What Trump also believes to be true, of course, is that President Obama was to blame for the way the Brexit vote turned out. Trump mentioned in his press conference Friday that Obama voicing his anti-Brexit view “perhaps caused it to fail,” because “a lot of people don’t like him.” It's certainly a pot calling the kettle black situation here, since Trump has record high unfavorable ratings with U.S. voters — but concerns about hypocrisy haven't stopped Trump yet.